Casino parties are one of the unique specialties of Las Vegas city. People from all around the globe travel down to the city of Vegas to enjoy the casino life and be a part of all the fun moments enjoyed in casinos. What if you get the same experience at your desired place? BAM Casino Parties carefully organizes the events that bring together the casino parties fun at your doorsteps. Plan an event with us in San Carlos and we will host it for you in the Vegas style. Reach out to us with your requirements and we will have a custom-tailored plan to entertain all your guests in the best manner. Our team of skilled and experienced professionals will ensure that you enjoy your party while they take care of your esteemed guests. They will guide your guests through the different levels and rules for the casino party in San Carlos. You may be planning a corporate event or a small get together with your family or friends or it may be any big event to celebrate. We offer our services for any kind of events or occasions at your preferred locations. It’s time to tap your feet in the rhythm with BAM casino parties San Carlos, CA. We will host your party like none other by engaging your guests, gearing up their sensations, crafting a complete package of fun and excitement. We feel proud when your guests praise you for the arrangements at the party. It is a moment for us to celebrate when your guests cherish the event and talk about it even after the fun time is over. Our team at BAM Casino parties specializes in organizing any kind of events, be it a small house party, charity occassions, fundraising events or a grand celebration, our dedicated staff will leave no stone unturned to win your guests’ hearts and make an event a memorable one for you. Let the thrill and enthusiasm of casino parties sway you !! Feel the craziness in the air, get your feet moving to the rushing beats, forget everything, enjoy the moment, feel the adrenaline rush in your blood, be a party freak as it’s party time!!! Enjoy the loud and booming party environment; be a part of fun-filled party games, feel the vibes of the reels, get excited with the shuffling of cards, cross your fingers to hit the lucky number on the dice, hit the jackpot, shout out loud. We ensure that your guests be always on a gaming mode while they are still in the party. We ensure that you enjoy the party and attend all your guests well, while leaving all your worries on the BAM Casino parties team. Let your guests enjoy to the fullest and carry memorable moments with them. 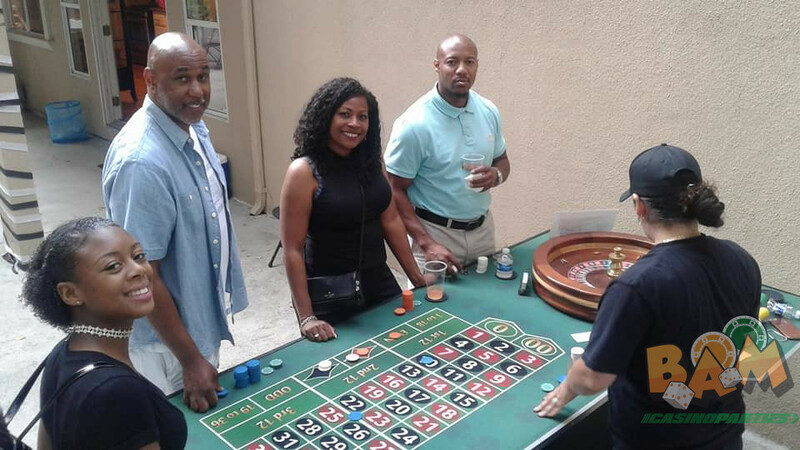 You can always be assured when BAM Casino Parties, San Carlos take charge of your party and casino rental equipments like roulette table, blackjack table, patio tables. You choose your desired game and we are here to provide you an entire setup for the gaming tables listed for your event. We perfectly ensure to offer you the best services at your preferred location in the city. Leave your worries with us and have fun! It’s your event, be the best host and enjoy the moments with your esteemed guests instead of worrying about the arrangements and party proceedings. Our skilled team is a group of experienced Casino dealers who will manage your event in a professional way, ensuring your guests feel at ease.